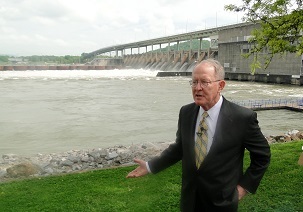 Senator Lamar Alexander Monday spoke at the groundbreaking of a new water treatment facility at Y-12, “Outfall 200,” which supporters say will help reduce the amount of mercury getting into Tennessee waterways to safe levels and make it possible for cleanup work to begin at Y-12. “In May 2013, I came to Oak Ridge to announce that a new water treatment facility would be built at Y-12 at the head of the East Fork Popular Creek to prevent mercury that was once used to make nuclear weapons from getting into our waterways,” Senator Alexander said. “That day, I made a personal commitment to address one of the biggest problems we have from the Cold War era – mercury contamination – and help fund a solution. Today, I am proud to see that we are breaking ground on the new water treatment facility. Senator Alexander said the new facility – which will be called “Outfall 200” -- would not have been possible without the hard work and coordination between the U.S. Department of Energy, the Tennessee Department of Environment and Conservation, and the Oak Ridge community. “I am grateful to all of those who have worked together over the past few years to get a result. Today, as we are moving another step closer to safer, cleaner water for East Tennessee, one of my top priorities will continue to be funding cleanup work in Oak Ridge because doing so fulfills our commitment to address our nation’s Cold War legacy, makes our environment safer and cleaner and supports thousands of jobs for Tennesseans," Senator Alexander said.